"When I get angry, I write. I write for two reasons: love and revenge." Greetings, good people of the internet! It's time to meet the Angry Reader of the Week, spotlighting you, the very special readers of this website. Over the years, I've been able to connect with a lot of cool folks, and this is a way of showing some appreciation and attention to the people who help make this blog what it is. This week's Angry Reader is Emily P. Lawsin. I am Emily P. Lawsin, the daughter of Filipino American immigrants who were survivors and guerrilla fighters in World War II, proud card-carrying union members in America, and community leaders in Seattle. I am a second-generation Pinay -- Filipina American woman -- oral historian, spoken word performance poet, and educator. I am the proud mother of two amazing children -- a tween and a toddler -- who love art, activism, music, and this Angry Asian Man website! The eldest and I are past Advisory Board Members of the Allied Media Conference. The youngest was born with Down syndrome and a hole in her heart, and her story made the cover of Parent Map magazine. I am the partner of Scott Kurashige, a loving father and ethnic studies scholar-activist, most well known for his work with the legendary Grace Lee Boggs. I am currently the National Vice President of the Board of Trustees of the Filipino American National Historical Society (FANHS), a completely volunteer-run, grassroots, non-profit organization that welcomed me, and many others, in when we were only teenagers. I am a charter member of the Lecturers Employees Organization (LEO) union, which is currently bargaining for a fair contract for 1,700 lecturers at the University of Michigan. 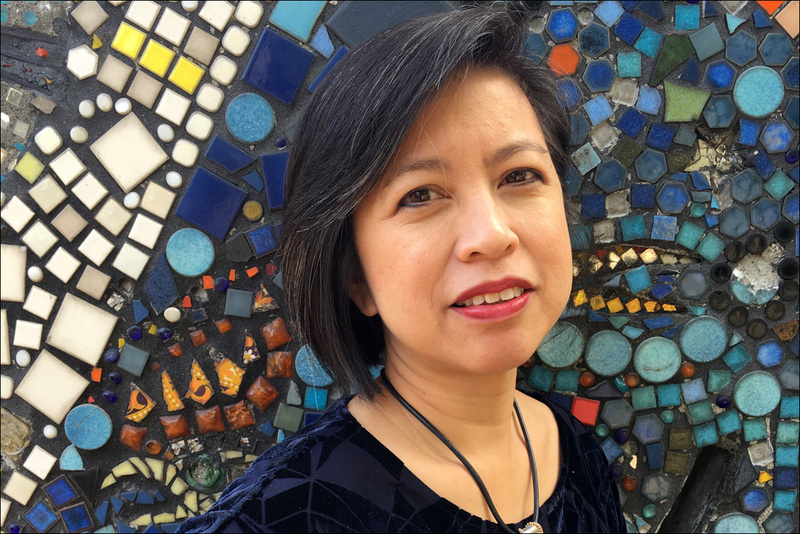 (#RespectTheLecs) I am also the co-author, with Joseph A. Galura, of Filipino Women in Detroit: 1945-1955, Oral Histories from the Filipino American Oral History Project of Michigan. I am blessed and humbled by all of the students, alumni, scholars, activists, artists, pamilya, and community folks, who have supported me in love and struggle. I am in Ann Arbor, Michigan, where I have worked for the past 18 years. I am sitting in a café (because my office has no windows), watching the snow fall -- in April. and the Alphas on the left stomped for their step show in the street. That mirror Detroit’s Black Bottom soils of a paved-over Paradise. Lafayette Park and the far Eastside. her endless jab of: "Walang hiya ka ba?" Have You No Shame? that I will never be able to repay. with raw egg on rice and called that a meal. giving birth to babaylans and diwata dreams. Where I can forgive, but never forget. In addition to all of the above, I teach Asian/Pacific Islander American Studies and Women’s Studies, as a Lecturer IV (senior lecturer) at the University of Michigan. I first started teaching Asian American Studies and Filipino American Experience classes 25 years ago at UCLA and California State University Northridge. I am all about learning to love our people, and loving to learn about our people. I am all about Filipino American history, HERstory, and OURstories. I am all about Filipino family, faith, and food. I am all about people watching and writing poems on napkins, airplanes, or buses. I am all about this new music video, "US", by hip-hop artist, Ruby Ibarra; it is a Pinay anthem, featuring Rocky Rivera, Klassy, sistahfriend Faith Santilla, my "niece" dancer Mahalaya, and over a hundred of my kasamas, comadrés, babaylans, Filipina American women. When I get angry, I write. I write for two reasons: love and revenge.